Section menu "File \ New" A set of letters is when the number of results coincides with the number of responses for each question. After passing the test are calculated, a number of the most frequently chosen, the result from this number is issued as a result. 3) Number of tickets - For example 4. The program is divided 100 to 4, get one ticket for 25 issues. Then randomly selects a ticket, say №3. This means that will be asked to №51 on №75. Remember one rule - the total number of questions must be divided by the number of tickets without a trace. If you click on the menu "File \ Start over", the program will open the ticket that the pupil had not yet seen. Once all the tickets are selected, then all starts again. Main number of responses - For example, most of the questions has the same number of answers. 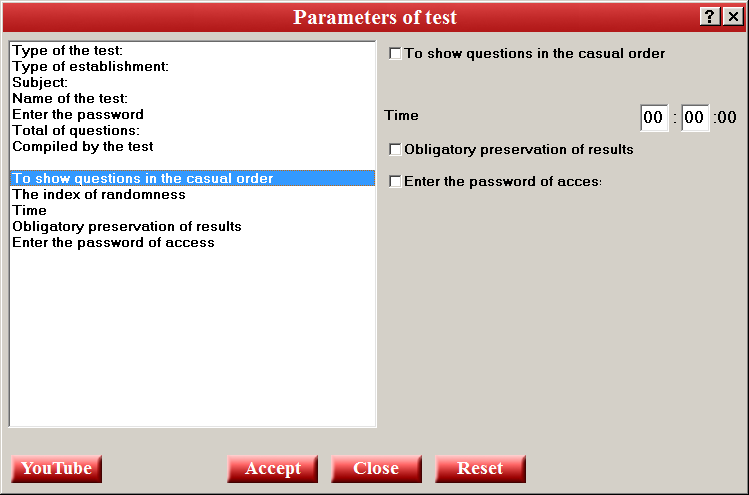 To save time, select the number at the beginning of the creation of the test. Quantity of results - To end the program showed only the amount of points, leave zero. Show questions in random order - The program will show the first 20 questions. If you check, then randomly selects 20 questions out of 100. Compulsory saving results - Before starting the test the student must open the file in which the result will be saved, and enter their name. If for some reason the program will not save the information, then instead of evaluating and interest appear question mark. In this mode, I advise not to include the "indicator of true answers." If a student does not pass the test to the end, in the table of results it will put a dash. Enter questions and answers Quick entry - Enter the entire test in Word. At the beginning of the issue should melt the sign "#" immediately after the response to the prompt, enter the new score. In the beginning by the sign "?". Help is additional information that is indicated by a "[?]". When you hover the mouse on the mark, the text appears. Insert it into the program, make sure that the questions and answers took only one line and then "Accept". ALL !!! TEST READY !!! The program can start downloading the text with the first question or the one where you are. Example: Once again File \ New , enter any naming test and password, the total number of questions is already two, "Accept" button. F4 , select the second question again Test \ Fast loading issues , insert the same text, "Accept". Click Back and you will see that the question №1 remained empty. If you want to view or print the entire test it, then Test \ Show entire test. Normal input - first introduced the issue, choose the number of answers, type the answers. 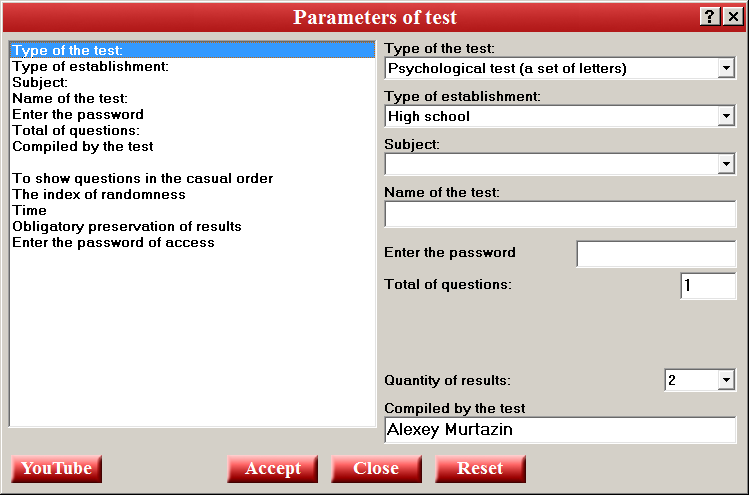 Then click F2 , or double-click on the appropriate question number and earn points. Use the "up", "down", you can sort through questions and answers. If all questions have the same answer, such as: "Yes" and "No", then enter them in the first question, and then click the menu "Test \ Copy the answers to all the questions." If the answers to all questions have the same points, such as the first answer - 1 point, the second - 2 points, then enter them in the first question, and then click the menu "Test \ Copy points in all questions." Entering results Press the "Result", enter the text for each letter. Several psychological tests can not be combined into one. Click "Accept", the right mouse button and select "Print". Or copy the text in «Word».